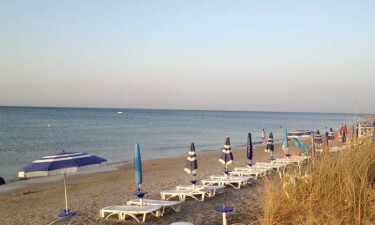 Situated near Lecce, a charming Italian town dubbed the Florence of the south, the Torre Rinalda holiday camping site is located adjacent to a long sandy beach on the Salento Peninsula. 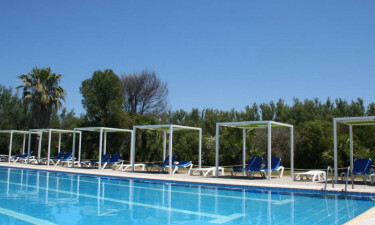 The luxury camping site offers visitors access to the golden sandy shores of the Mediterranean Sea. For those who love the appeal of a seaside luxury campsite with verdant plants, fragrant flowers and trees around the borders, Torre Rinalda is ideal. Contact LUX-camp now to secure your holiday place. 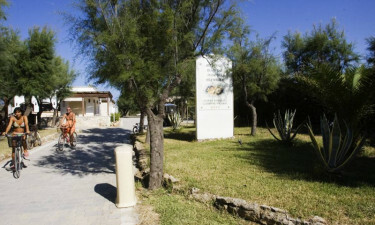 Why choose Torre Rinalda luxury camping? This 4-star site opens from late May until early September and boasts a large rectangular swimming pool with loungers and a separate children’s pool. Surrounding grass and trees make a scenic backdrop, while the long sandy beach is just down the campsite path. Here, sun beds with parasols are available for hire. This part of the Italian coast is ideal for leisurely mornings, lunchtime picnics or lazy afternoons paddling in the shallows, swimming or sunbathing. Torre Rinalda luxury camping offers everything a family needs to relax and enjoy themselves; the youngest of the family can make sandcastles to their hearts' content while later, the adults may wish to take a stroll and enjoy the moonlit views. An activity programme runs from the end of June to the beginning of September. Apart from beach volleyball, there is a basketball court area, tennis, a children’s playground and even the chance to try archery. Other activities include bike hire, five-a-side football and evening entertainment. Lecce is just 15 kilometres away and has a historic town centre with a Basilica known for its Baroque architecture. Alternatively, the Duomo cathedral overlooks the landmark Piazza square with its Gothic remains beautifully lit at night. This attractive town has intriguing winding streets to discover and a Roman amphitheatre to see. Moving on, the highly rated and family-run Fagiano Lecce museum helps visitors to discover the history of the local area from ancient times to date. 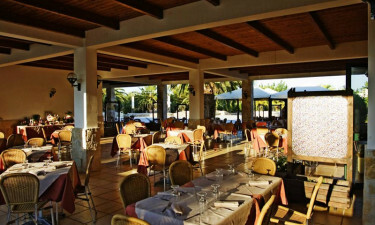 Finally, there is an ample choice of restaurants with menus from pizza to a leisurely lunch and a la carte dinners. The site offers a breakfast and pizza restaurant with seating to eat-in, or a takeaway service. Additionally, the beach bar offers the opportunity to sip a drink and watch the world go by. Holidaymakers can buy newspapers and magazines or visit the tobacconist at the onsite market. A laundry service and free Wi-Fi access are also available.